I’ve been hearing a lot about Korean skincare lately and I’ve been doing some research on the kind of products they use everyday. Something that really struck me was the importance of toners and essences so this really made me want to try it out. I went to beautynetKorea to see what I could get my hands on. 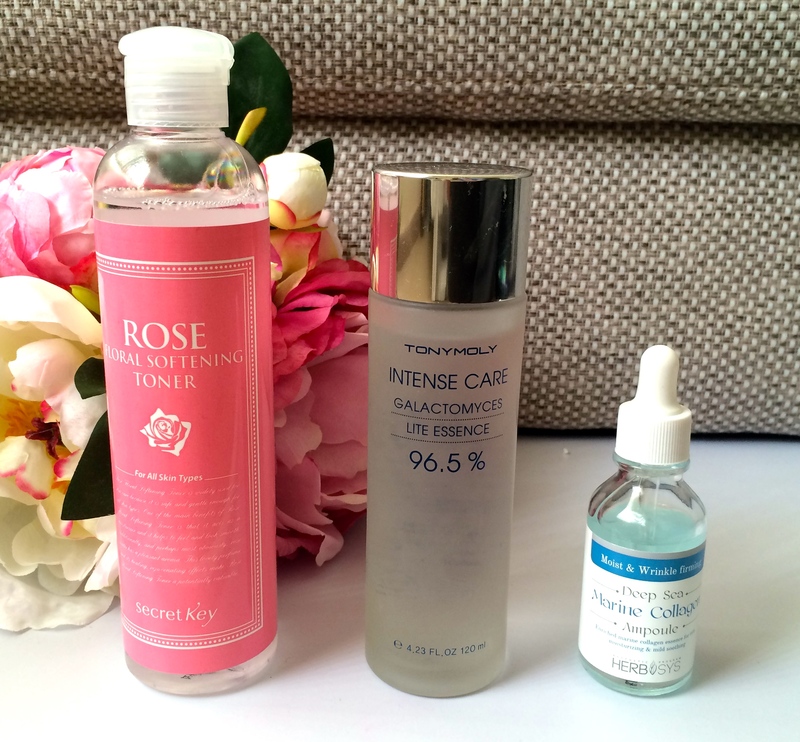 I’m currently quite happy with my cleanser and moisturiser so I really wanted to try a new toner and a new serum. Now my skin type is combination/oily yet in winter I get some dry patches along my jawline that is really not attractive when my makeup clings to it! So I was looking for something that would hydrate those areas yet wouldn’t make my make me look really shiny with makeup on. I spotted the Secret Key Rose Floral Softening Toner – this promises to soften the skin which I though would be perfect to soften up this icky dry patches and hydrate the skin without the abrasiveness of a lot of toners. This toner is really beautiful and refreshing, it refreshes the skin whilst adding some moisture to the skin. I’ve been using this for about a month now and I really think its working! I use this after I wash my fine and it has been leaving my skin nice and soft as well as plump. Next I heard about the popularity of essences, this is a water substance that has a shed load of transforming properties and will add brightness and clarity to your skin, what’s not to love about that? This is the Tony Moly Intense Care – I use this one straight after the toner. I love these two products because they are super moisturising yet it doesn’t feel like you have a thousand products on your face, they are so thin that it just feels like you have splashed your face with water. After this step I use the Deep Sea Marine Collagen Ampoule – this is a type of serum that is super concentrated and is full of all the good stuff. This particular one offers a collagen boost as well a a lot of hydration, this again is a beautifully thin substance so I use this morning and night and it doesn’t add any greasiness to my skin. This ampoule literally plumps up my skin on touch, I can noticeably see the difference when I am applying it, it clears the skin by smoothing it out and just adds some supple plumpness giving me a very youthful look. At night I put this on after the essence and before my hydroluron and night cream. Now as these products were pretty darn cheap I wasn’t convinced that they were going to do anything spectacular to my skin however, I can now eat my words! Over the past month my skin has been looking better and better, it is really well hydrated, super plump from the ampoule and it has a lot more clarity to it. I still do have a bit of redness but my skin in general is much clearer and has a much better look and texture. I honestly think I am now a convert to Korean skincare, they definitely know what they are doing! There are so many amazing Korean products, it’s awesome you found ones that work out well for you. I love how cheap yet effective many of them are! They really know what they’re doing when it comes to skincare! If you have any suggestions I would love to hear them!